Next Post Scotty, we need more power! Careful they’ll steal her breath! SO adorable… all of them! Norah is just so adorable I wanna just smoochy her beautiful bald head!!! 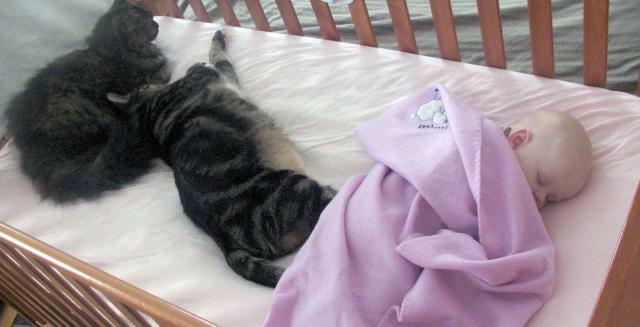 Until Norah was three months old, she never slept in the crib. She would sleep in our arms, or in a baby sling, but never in the crib. Sometimes it takes a while for the wee ones to sleep soundly enough to be able to detach them and actually put them down. Now that’s a cute cat picture.